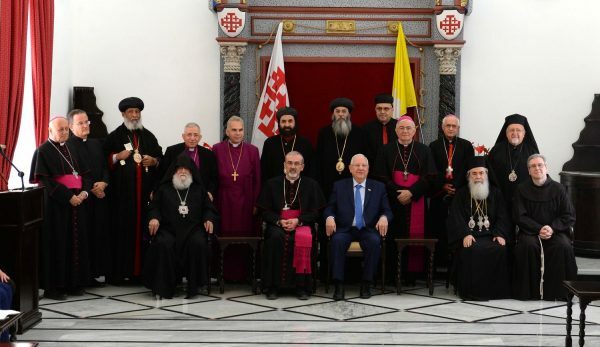 Israeli President Reuven Rivlin said the persecution of Middle East Christians is “a stain on humanity” during a meeting Wednesday with the head of the Latin Patriarchate of Jerusalem, the Greek Orthodox Patriarch and other Christian leaders. Israeli President Reuven Rivlin with leaders of Jerusalem's Christian community. Credit: Mark Neiman/GPO. Rivlin noted ongoing persecution of Christians such as the Islamic State attacks against Egyptian Coptic Christians in the Sinai Peninsula as well as attacks in Syria by Islamic State and other Muslim extremist groups. “I say to you here, our Christian brothers of Jerusalem, our thoughts are with you at this difficult time,” Rivlin said during the Jerusalem meeting, which came several days after the Easter holiday. “We have all seen the pictures from Syria; I visited some of the injured being treated in Israeli hospitals. What has happened there to the Christian community—and to the whole country—is a stain on all humanity,” he said.